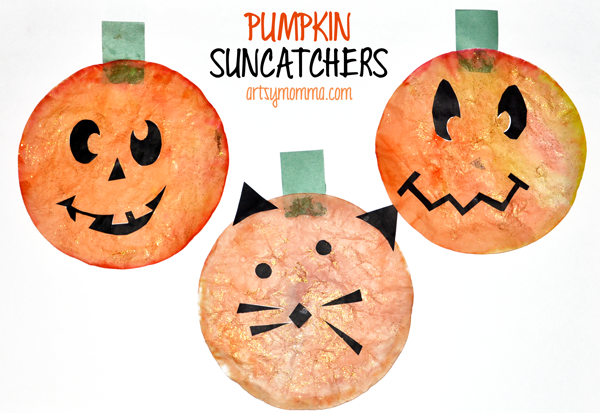 Halloween is a favorite in our home and we just love making spooky crafts to decorate with! Last year, we shared a handprint pumpkin craft. 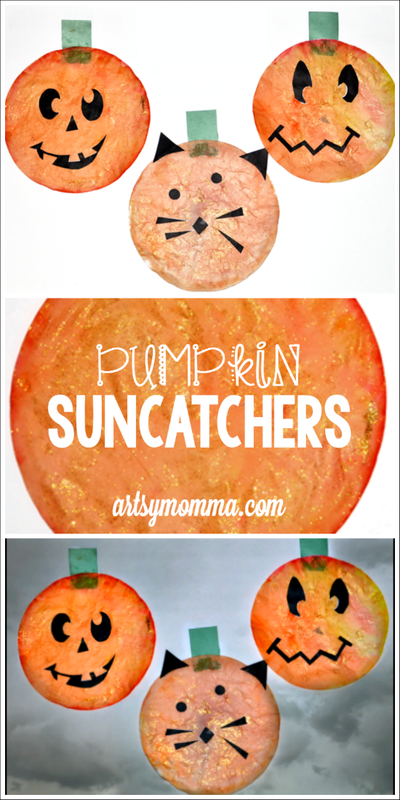 This year we are sharing our most recent project – sparkly Pumpkin Suncatchers made with coffee filters. The kids and I had a lot of fun creating our suncatchers which are easy to make. Our finished pumpkins look so pretty and festive hanging in our windows. Get out a cookie sheet or plate (we used paper) to place your coffee filter on. You may also choose to place a towel, newspaper, or tablecloth underneath the plates to catch the water sprays. Start by coloring the coffee filters with markers. We used different shades of oranges and yellows as well as a red-orange. Spray with water. My son sprayed mine for me while I reminded him not to go overboard with the water. My toddler’s had some white spaces so we lifted it up and placed the white spaces on the marker puddles. Set aside to dry. 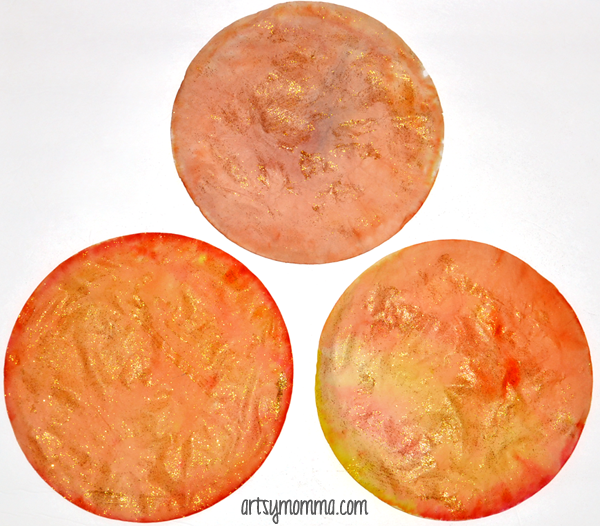 While the coffee filters are drying, browse online for pumpkin face templates. Print and cut them out. You could also draw your own with markers or make faces from construction paper. Also, cut stems from green construction paper. After they have dried completely, squeeze gold glitter glue all over it. Use a paintbrush to smear it all over. Glue on the pumpkin faces and green stem. Let dry and then hang your beautiful pumpkins in a window with a little tape. This craft can be adapted to kids as young as toddlers yet appeal to older kids as well. Parents might also find this activity enjoyable to make with their kids – I loved making one right along with my son. He loves watching how I color things plus it gave him another coffee filter to spray with water. My kids get excited every time they get to use a spray bottle! 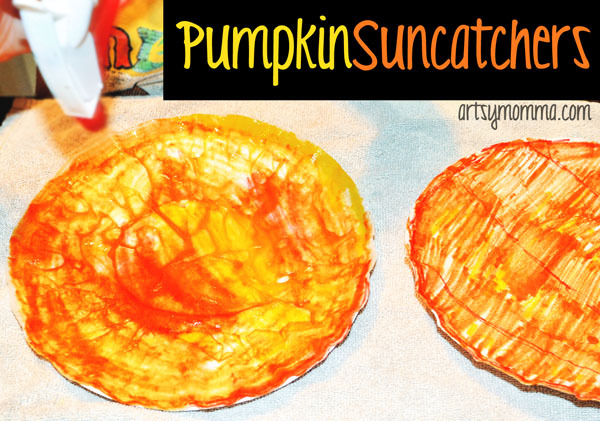 You could get the whole family involved and make a family pumpkin patch of pretty suncatchers. Bonus: This craft helps toddlers and preschoolers practice their fine motor skills which helps them get ready for writing. Preschool and elementary age kids get to practice their scissor skills too! My kindergartner liked that he was able to practice cutting curved shapes and even attempted the zig zag mouth. What spooky Halloween crafts do you plan to make this year?